The year had barely got going when I recorded Lentinellus cochleatus from the South Wood of the Kenwood Estate. Commonly known as the Aniseed Cockleshell and for good reason as this species has the aroma of Aniseed, to varying degrees. However my collection did not have this smell and did not have various microscopic features, therefore this collection was a variation known as Lentinellus cochleatus var. inolens. Unfortunatley this specimen was not in good condition so I was unable to obtain photographs worth looking at. This was a new record for the county of Middlesex and of course for Kenwood and Hampstead Heath as a whole. It is fairly unusual for this to be fruiting at this time of year but I have seen it once before in late winter at Lavender Pond in Rotherhithe, South East London. A week or so prior to this find and following the thaw of the December freeze, Pleurotus ostreatus, The Oyster Mushroom seemed to want to make a dash for it and was found fruiting profusely in three different locations. Following the very dry spring of April and May things have somewhat got back to normal with what for some has been a disappointing June & July following a fair amount of rain. The spring walks went very well actually with Chicken Of The Woods playing a starring role. 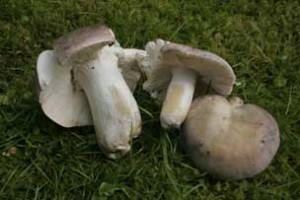 St George’s Mushrooms arrived early during March and made use of the moisture available a that time. Unfortunately by the time the walks came around they had all dried up. I did find the odd one following rain during June. Now that we have had some decent rains, Russula and Boletus species have begun to come through as well as an assortment of other genera such as Inocybe. This all looks good for the continuation of the walks in August through to a good and fruitful autumn. We are now practically at the end of September and the fungi have been out in force. 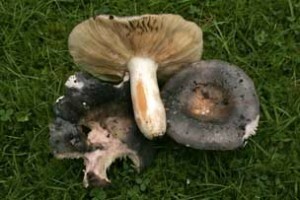 Climatic conditions have been very ‘fungi favourable’ with very warm spells interespersed with rainy periods. With a slight lull here and there, things certainly look set to keep on rolling. The Russula in particular have put on a fantastic show so far this year, not least the variety of Crab Brittle Gills popping up with Oak and Beech trees, among them a new record for Hampstead Heath of Russula faginea and I’m pretty sure some of the other ‘crabbies’ photographed and collected this year will be new species records. 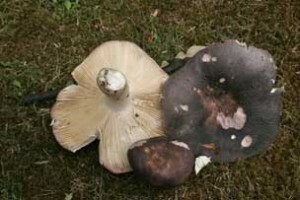 Russula grisea and R. ionochlora have also been prolific in various areas, with different host trees, such as Oak, Beech and Sweet Chestnut. I have been having a personal battle with these two species, as they are so closely related it is often quite difficult to tell them apart , even microscopically. But I think I have gotten there in the end with a still clearing definition, at least macroscopically. This tussle has been going on for some years now and I’m sure hasn’t ended here, even though now I do feel some acceptance of there being two species involved rather than just the one. Note the more greyish appearance of R. grisea above, mixed with a purple colouration which often bleeds into the gills from the cap edge. The gills are often cream. Also note the strong Iron Salt reaction, here it is orange in colour. Typical of R. ionochlora is the greenish centre to the cap, which is surrounded by a greyish-purple through to pink. Hence the common name for this species of Oil Slick Brittle Gill. The two specimens below show the extreme colour variation in the species. The Iron Salt reaction show here can be quite strong = orange. 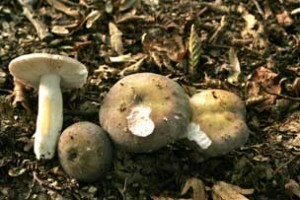 Below Russula cyanoxantha & R. ionochlora side by side and showing the negative and positive Iron Salt reaction, respectively from left to right. 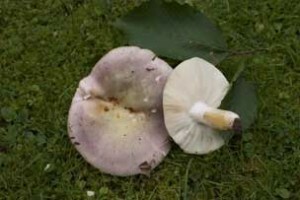 A new species of Russula, R. plumbeobrunnea which has apparently been ‘hiding’ within the various forms of Russula parazurea and R. grisea for some time it seems, has been entered from Germany by Jurkeit & Schobler. Following many sightings and collections from all over Germany but particularly in the North, over many years . It has been separated from closely related species on microscopic differences, most notably it has reticulate spores like those of the genus Lactarius. Maybe it is on the way to becoming just that. Anyhow, now we have another species to bear in mind, is it grisea? ionochlora? no its plumbeobrunnea!!! apparently its as common as muck in South East England, agghhh!!! da da da da reuters reuters Russula reuters…………. get on that microscope girls & boys!!!! Boletus have also been enjoying this weather and some rare species have been putting in an appearance including a new record for Middlesex Buchwaldoboletus lignicola. The usual suspects B. edulis, B. erythropus and an assortment of Xerocomellus suchas X. engelii, X. subtomentosus, X. cisalpinus, X. chrysenteron and X. badius. This abundance and diversity of species has been no more apparentthan on my forays at Puttenham Common, which have been exceptional this year. 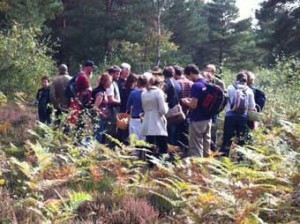 Puttenham Common on a beautiful day can be something else, magical, this was one of those days. 81 species were recorded. And then came October……………….I haven’t known an October like it, especially in the South East of England, since the drought ridden years of the early noughties, which then effected the whole of the country. 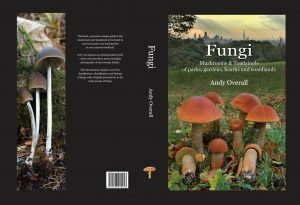 This time, London and surrounding areas, had virtually no rain for 5-6 weeks and in response, the larger fungi, usually present at this time of year, were not forthcoming. Trips to the New Forest, where more rain had fallen during October, told a different story, but Hampstead Heath, Epping Forest and Wimbledon Common were parched and little was on show. October was a struggle but we managed ( as always) to make the most of this unusual October and the few fungi that did show up for the dance. November, thank heavens, proved to be October in disguise. With heavy rain, drizzle and unseasonally high temperatures, once the the damp weather had penetrated the soil and wood, during the second week, it was literally the late show with a fungi of all kinds appearing all over. My last visit to Epping Forest on Nov 13th is usually a rather brisk affair with temperatures in single digits but on this day we were soaking up the rays, exhalting the autumn colours and coming across a whole suite of glorious fungi. It was a fitting end to what was a very up and down season, with Epping Forest, before Nov 13th proving to be very disappointing and rather tiresome at times, as was Wimbledon.